Our September Bark Box came as we were getting ready for our first show. I did a quick peek, but haven't been able to go through the box until now. Want to know what was inside? The first thing Jedi pulled out was a venison ear from Superior Farms. Jedi says forget pig ears, he likes these better. Sticking with the venison theme, there was a Crunchy Deer Chew from Etta Says. Jedi loved it! 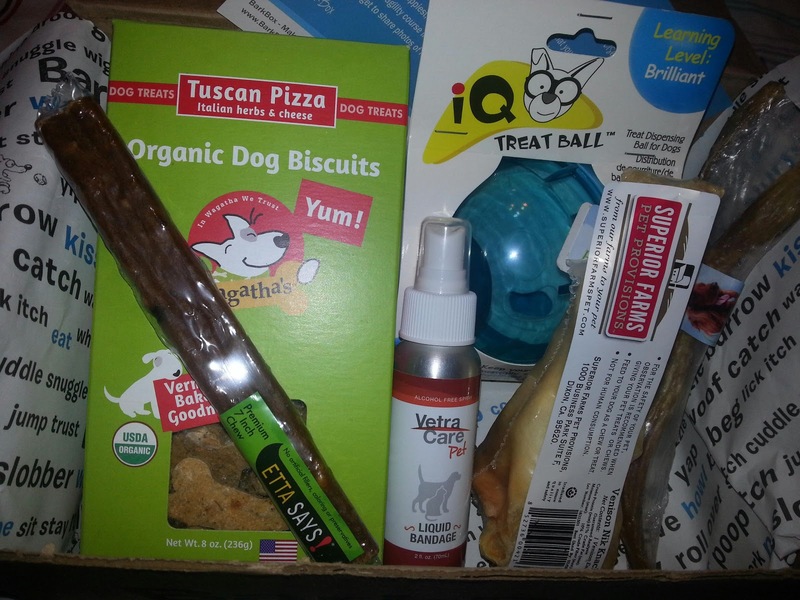 Bark Box shared several duck products from Etta Says in our first Bark Box and Jedi loved them as well. Even picky Roxy liked the meaty chews. Note to self, buy Etta Says products for the dogs. Another company used often by Bark Box is Barkworthies. Last month they sent a bag of bully flakes. The dogs loved them but the smell made me gag. This time it's an angus tendon. I haven't opened it yet. I'm hoping it smells better than the bully stick stuff! 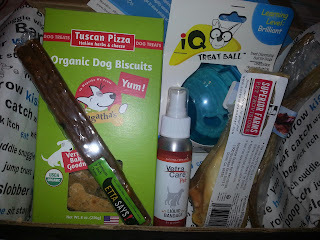 An interesting thing in the box was a box of Tuscan Pizza Organic Dog Biscuits from Wagatha's. They're wheat free, crunchy biscuits. Roxy refused to eat it. (She doesn't like any crunchy biscuits, so I'm not surprised.) Jedi didn't know what to think either. He took it, held it in his mouth, dropped it, then held it in his mouth again before eating it. We had just had pizza for dinner, so I think he figured out it was not the same. BTW, Jedi prefers Domino's. My favorite thing in the box was the IQ Treat Ball. I love puzzle toys (as seen here and here) and have reviewed a half dozen or so. No joke, this is the one that Jedi has liked best. I pulled it out to entertain him while we were packing for the show. It worked! We even took it with us last weekend so Jedi could bat it around the hotel room. The last thing in the box was very interesting: Liquid Bandage from VetraCare Pet. I spent a good 10 minutes surfing through their website and find it interesting. Coincidentally, Jedi has an irritation in his armpit. The site says that this product will provide a breathable barrier to promote healing. We're going to try this one out today!